Join the Tofino Community Food Initiative for this West Coast favourite to celebrate food resilience in our region. 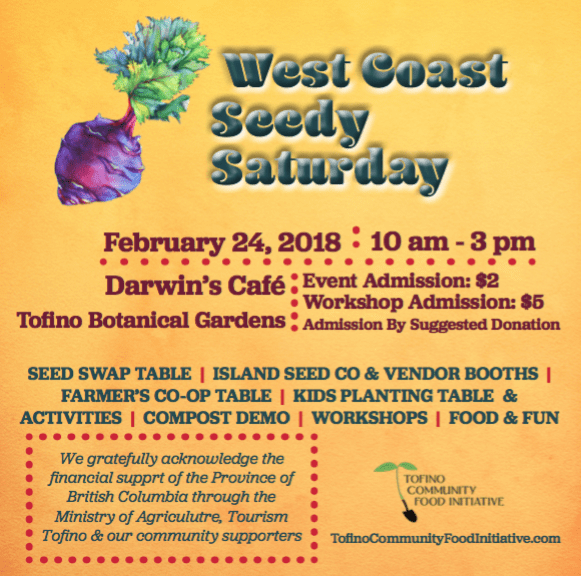 A fun-filled family event including kids planting tables, island seed companies, garden-related vendors, farmer’s coop table (local farm fresh food), seed swap table, compost demos, workshops and more! Just starting your garden? Gardening with children? Attend the “Beginner West Coast Garden” workshop (perfect for parents and their kids). Learn what plants grow best in our climate and the ones the kids love the best! Walk away with a garden plan and a few seeds planted and ready to go into your spring garden. This workshop will be led by Leah Austin. “The Conscious Gardener” talk will be held by Connie Kuramoto. Gardening can be a great tool to increase our awareness. A good gardener must use all their senses in order to tune in and work with nature. Come join Connie as she explains how to start your garden or renew the connection and passion in your garden with a complete awareness of what is going on. Have you grown Quinoia? Buckwheat? Amaranth? Here’s your chance to learn more. Dan Jason, founder of Salt Spring Seeds, passionate gardener and seed saving advocate will highlight some of the ways to grow these and other grains and seeds in our Canadian climate. Be sure to visit his table at the event to learn more and pick up your copy of this awesome book (includes some fabulous recipes by Michele Genest). Location: Tofino Botanical Gardens and Darwin’s Cafe.